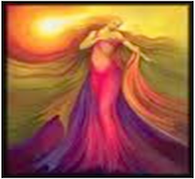 The Solar Goddess Radiance was channeled by Rev. Anna May during a Beltane ritual to celebrate the beginning of summer. During the Beltane fire festival ritual, Anna and many others celebrated the waxing of the Solar current as the Goddess Sunna rides the sky, drawing closer to the Earth and bringing the world back to life after the colder winter months. Starting at Mid-Winter and increasing in influence as the year turns to Midsummer, Sunna’s power is felt and its effect seen, all around us. The sleeping trees awaken, stretch to the sky and green; flowers and plants stir within the dark Earth as they sense her warmth and emerge to bask in her light; hibernating animals awaken and begin their annual rites of courtship and subsequent mating rituals. During this time, the world is filled with expressed fertility and abundance, the encouragement and nurturing of life, and the joy and hope the season evokes with such bounteous scenes that affect us all. You can almost taste the healing quality of the energy in air. This force of energy will become part of you and will be stored within your energy field to be called upon whenever you would like to invoke and express this energy for whatever purpose you choose.